The Philips 499P9H was designed for professionals and multitaskers who require an extended canvass to streamline workflows and enhance production. 49-inch monitors raised a few eyebrows when Samsung made it available, but the current growth spurt of the category doesn’t lie about its success n the market. The Philips 499P9H packs attractive features, but how does it stack against its equally opulent opponents in its hot segment? The Philips 499P9H sports a clean and straight forward aesthetic that includes a matte black housing and with sweeping lines. The 49-inch screen doesn’t have bezels on three sides, but the dual stage design still includes hidden panel borders. The screen looks unhindered and is great for multi-display setups, but we don’t think that will be the case here. 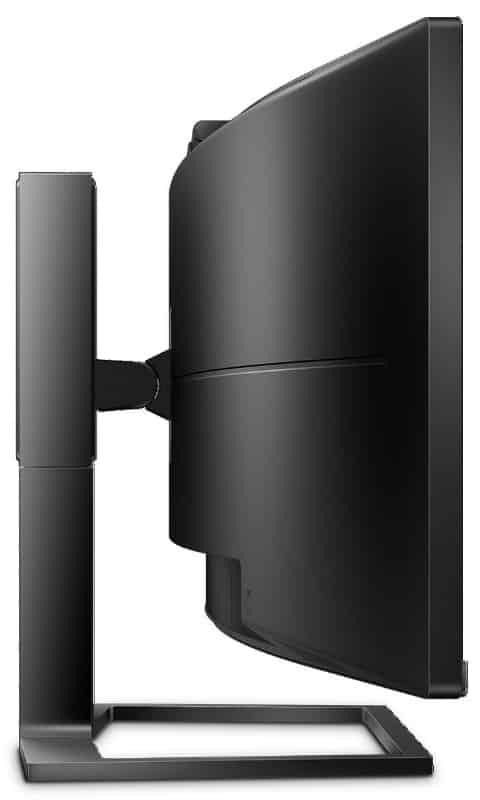 The most noticeable characteristic of the Philips 499P9H is, of course, its size which almost breaches four feet in width. You will need a massive desk and the clearance to go with it to accommodate a monitor like this model. The device weighs a little over 33 pounds which gives a feeling of solidity and rigidity for your peace of mind. Build quality on the Philips 499P9H is on the excellent side since the device can stand without wobbling despite its massive heft. The plastic panels go together seamlessly, while the rest of the product exudes a premium feel. Philips spared no expense in making this device, setting it far apart from some of their budget models we tested. There is a pop-up camera at the middle of the Philips 499P9H’s top bezel which you can set by gently pressing it. The camera installed is Windows Hello compatible thanks to its infrared sensors which allow for depth measurements needed to map faces. The 2-megapixel sensor captures great image quality, but its HDR mode does little to make a difference. The Philips 499P9H’s connectivity is equally impressive as its display area due to the modern ports it includes. The monitor utilizes DisplayPort 1.4 as a primary input along with dual HDMI 2.0 slots, but what stands out is the USB-C slot with 65 Watts of charging power. You can connect a USB-C laptop like Apple’s MacBooks, but the wattage may be insufficient to charge the meatier variants. In addition, you will find a total of four USB 3.1 slots for accessories and peripherals. There is also an RJ45 ethernet jack for internet connections, but it isn’t as fast as those found on your motherboard. A pair of 5-watt speakers are included which sound decent, but a separate set will still be better for games and movies. The Philips 499P9H includes a flexible stand which offers tilt, swivel, and height adjustments. Of course, pivoting isn’t included since its impossible for a monitor this wide, unless you go with a very articulate monitor arm. Aftermarket mounts and stands will connect to the 100 x 100 bolt pattern hidden by the removable mechanism. The base of the Philips 499P9H eats up almost a foot of depth on your desk, but it isn’t as consuming as most would expect. The hollow center is a great place to keep small doodads such as thumb drives or even small speakers. We also love the executive vibe it brings which is a better alternative to the gamer-centric designs which dominate the market today. The Philips 499P9H boasts a 49-inch VA panel with a gorgeous 5120 x 1440 resolution, 60Hz refresh rate, and 5ms response time. The screen is supported by a 450 cd/m2 backlight and is rated to have a 3000:1 contrast ratio for excellent depth. The form factor is comparable to two 27-inch 1440p monitors side by side, but the difference is you don’t have to deal with bezels in the between. The Philips 499P9H is massive, but its screen is pleasingly comfortable to view thanks to an excellent balance between sharpness and visibility. The pixel density of around 109 PPI isn’t as crisp as retina displays, but it still provides a massive advantage over 1080p screens. You won’t need to use Windows scaling with this monitor, and we know that is a huge plus for a multitude of users. 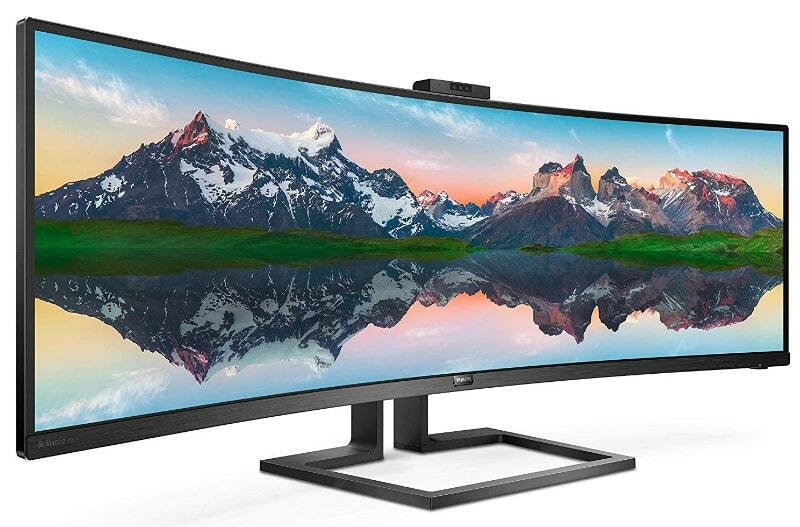 The screen’s 1800r curvature is also less intrusive at this size which spreads out the curve even further. It’s great for immersive viewing and gaming, and we did not notice any distracting distortion despite the sharper radius. Frankly, 1800r is more suited for 49-inch models compared to the smaller and more typical 34-inch displays we’ve seen in recent times. The Philips 499P9H is fantastic right out of the box with its 88% DCI-P3 coverage with a Delta E 2.1 accuracy score. The monitor includes a tuned sRGB mode which locks the screen to 100% coverage with a fantastic accuracy of DE 1.14, but it will also fix the backlight to around 350 cd/m2. Color temperature is close enough to the ideal 6500K, so calibration isn’t totally necessary. The screen’s gamma sits at 2.21, so it is more or less perfect for most uses unless you need to refine it for sophisticated photo editing. Philips did a good job at factory-tweaking this monitor, and its rare to see something that closely matches the claims on the calibration report that’s included in the package. Since the Philips 499P9H is based on VA technology, you can expect deep blacks and excellent color range which is great for games and movies. The monitor’s contrast falls short of the manufacturer’s specifications at 2550:1, but it still creates excellently low black luminance and a richer vibrancy we have come to expect from VA displays. The backlight on this device tops out at 470cd/m2 which is too bright, so we recommend turning it down to around 30% for optimal and safe usage. Panel uniformity is surprisingly good for the Philips 499P9H despite its massive size which is usually prone to leaks and washed out spots. There is no sign of backlight bleed on the test unit, plus color deviance stayed balanced except for the corners. Errors did not exceed DE 3.0 from the D65 standard on the farthest sectors, enabling the monitor to pass most reviewer’s uniformity standards. One of the weaknesses we can see with the Philips 499P9H is its middling pixel response time which isn’t great for gaming, but a non-factor for professional use. The monitor displays some trailing and ghosting when used to play games with heavily defined contrasting colors like Apex Legends, but you have to remember that this is a 60Hz VA screen. There is an Overdrive setting in the OSD, but selecting anything higher than the optimal level will induce overshoot which is counter-productive. The Philips 499P9H isn’t the best for games, but it still manages to include FreeSync support with a functional range of 48Hz to 70Hz. This model isn’t tested to be G-Sync compatible like many of the high-resolution displays in the market, so Nvidia users will not get to enjoy the stutter and tear-free benefits of adaptive sync technology. The monitor’s input lag averages at 11ms which means it’s responsive, but its limited refresh will be the deal breaker for gaming use. The Philips 499P9H is an excellent option if you are looking for a monitor that’s great for multitasking and ready to use out of the box. The brand’s factory calibration did wonders for this model’s image quality, so acquiring a colorimeter isn’t needed. The form factor is great for games, but sadly, there are better options when it comes to speed such as the Samsung C49HG90 even if it has a lower resolution. The Philips 499P9H costs more than a grand, but it is currently the more practical choice in the professional use segment. You get a ton of extra features such as a built-in Windows Hello-ready camera and excellent connectivity for the price which sweetens the deal further. If you are looking for an excellent super-ultrawide monitor for work and design, this model is one of the top choices out there.